The Hateful Eight might be one of the meanest, darkest movies I’ve ever watched. Still, I would also call it one of the most enjoyable. Despite its overwhelming bleakness it is never difficult to watch. The Hateful Eight has a running time of very close to three hours, but you never feel a moment of that running time. The film is mesmerizing, disgusting and utterly entrancing. Tarantino masterfully builds the bleakness of this film into every part. Starting with the beautiful landscape shots, showing snow covered mountains and forests barren of life, other than the stagecoach carrying some of movie’s travelers. The snow covers all life; nothing in this mountain wilderness is alive. Into this world is where our characters enter, with Samuel L Jackson’s Major Marquis Warren appears as if from nowhere, blocking the way of a stagecoach carrying bounty hunter John Ruth and his bounty Daisy. They are soon joined by another lost traveler, supposed Sheriff Chris Mannix. The four of them travel for some time, treating viewers to one of Tarantino’s trademark conversation scenes. Each one of these characters is horrible in their own way. Mannix is a former confederate raider, a man with who feels no shame about his racism. Daisy shows herself to be simply vile, being as awful as possible at every opportunity. The apparent heroes of the piece, Ruth and Warren, are only marginally better. Ruth quickly proves himself to be both violent and a fool. Warren is accused by Mannix of brutalities during the war, acts not confined to his enemies and he doesn’t even bother to deny the accusations. None of these are good people. When they reach their stopping point, a small respite named Minnie’s Haberdashery; the other four appear, other travelers waiting out the coming blizzard but not the people they were expecting. Warren is suspicious and Ruth suspects at least one of them is there to free Daisy. This is when the film switches to it true story, which is a murder mystery with eight (it actually isn’t eight, I can’t think of a way to count those in the cabin that doesn’t equal nine) terrible people trapped in the same place, all distrustful of the others, each with secrets. They are violent people trapped in close proximity until violence erupts. And things do get violent. As secrets are uncovered and violence is done, each character ends up looking worse and worse. Warren might be on the side of good, but his methods are anything but. He is the hero, but still manages to gloat over how much he loves to kill white people. Ruth may be admirable in many ways, but he is still a fool that when enraged beats a captive woman bloody. Daisy is awful enough that the audience cheered her beating. Still, by the end there is almost a bit of hope among all the blood and death. There is common ground found between two very different men. It maybe doesn’t matter, it isn’t likely to change their fate, but it is something. Watching a Tarantino movie is something like seeing Rembrandt do superhero comics. It is an unquestioned master working in a medium that gets little respect. Tarantino can set a scene and build tension like no one else, but he works exclusively in the lowest, most pulpy of genres. I wouldn’t want him to change for anything. He gets great performance out of great actors; there really isn’t a weak link among them, though the best are Jennifer Jason Leigh as Daisy Domergue and Walton Goggins as Mannix. Who is to say that spaghetti westerns or martial arts revenge movies aren’t deserving of true masterpieces. 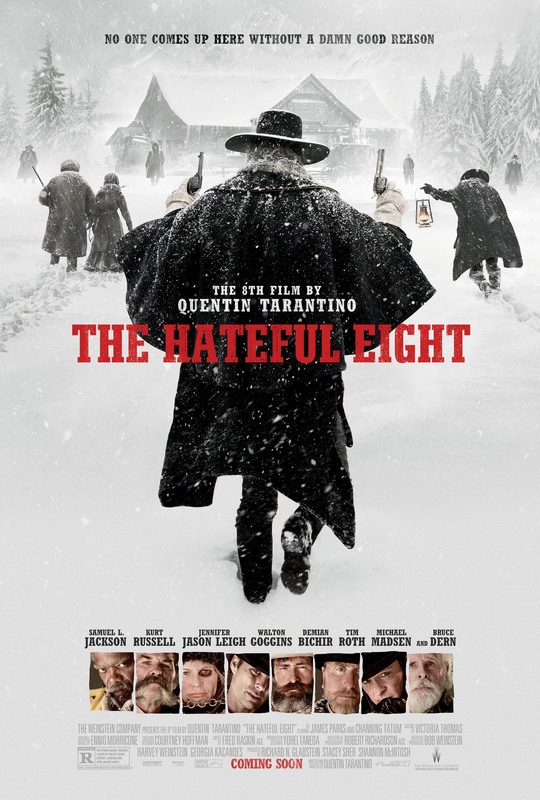 That is what The Hateful Eight, like Django Unchained and Inglorious Basterds before it, is: a masterpiece.